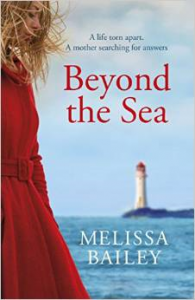 Today I’m talking to the wonderful people at TripFiction about the Hebridean setting of Beyond the Sea and how it inspired me. 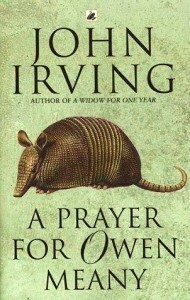 There’s also a fabulous review by them of the novel (…”a haunting portrayal of grief and its cruel processes”). 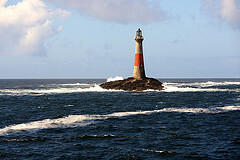 According to legend, Dark Beira, the subject of this refrain, is the mother of all the gods and goddesses of Scotland. The Queen of Winter, she is ancient, angry and terrifying, her complexion dark blue, her teeth rust red, her hair as white as frost. She roams the wilds of the north, growing ever older, but never dies. Because always, at the end of winter, she drinks the magic waters of the Well of Youth which bubbles up in the Green Island of the West and grows young again. Then the whole pattern repeats in an endless cycle. ‘I don’t believe it,’ says Sam, Freya’s son in Beyond the Sea. ’Beira couldn’t grow old that quickly and then become young again. I think it’s really just a story about the seasons,’ Indeed. But nonetheless I love it. I’m a huge fan of myths and legends – tales which, as Freya says, ‘might not be fact, that can’t be proved, but still might be something we choose to believe in.’ They are narratives which explain ancient cultures, their customs and history, their anthropomorphic approach to nature and the landscape around them. What is Beira, after all, but the creation of a people concerned by nature’s long, hard winters and relieved by the almost miraculous arrival of spring. 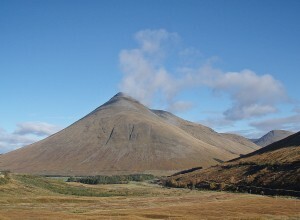 Beira, like the harsh weather itself, rouses the dangerous whirlpool of the Corryvreckan (by washing her shawl within its waters), brings the snow (by laying her clean white shawl upon the mountains) and creates torrents that cause lochs to form (by forgetting to cover over a bubbling well). 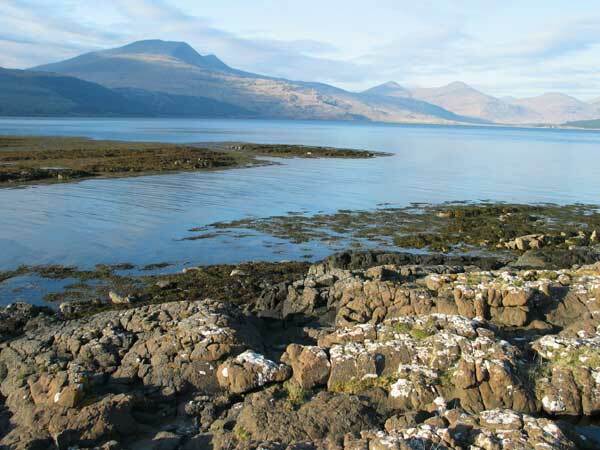 In the western islands of Scotland, there are also many myths of the sea. They find their origins perhaps in the restlessness of the ocean currents, but are then transformed into stories of the Blue Men, who seek to sink ships in the perilous waters of the Minch, or the Maid of the Waves, who, like the tides, protect and curse in equal, fickle measure. The stories are rich and colourful, demonstrating the ancient acceptance of the supernatural in the everyday – mermaids, sea fairies and seal-folk, the magical Green Island hidden in the west, where the spirit of spring resides. As a lover of both history and myth, it is the exploration of the crossover, one into the other, that I find particularly fascinating and love to explore in my own writing – the blurred line between fiction and fact in storytelling, between what is ‘real’ and what is imagined. And that in some cases fact is indeed stranger than fiction. It’s two years since my first novel, The Medici Mirror came out. Halloween was the perfect time to launch it and seems a fitting time to revisit it and tell you a little about the dark character at its heart and some of the creepy locations in which it is set. 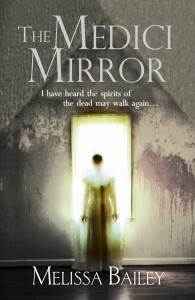 The storyline centres on the infamous sixteenth century French Queen, Catherine de Medici and her connection to an old, blackened, seemingly magical mirror, which has been passed down through the centuries leaving a trail of murder in its wake. 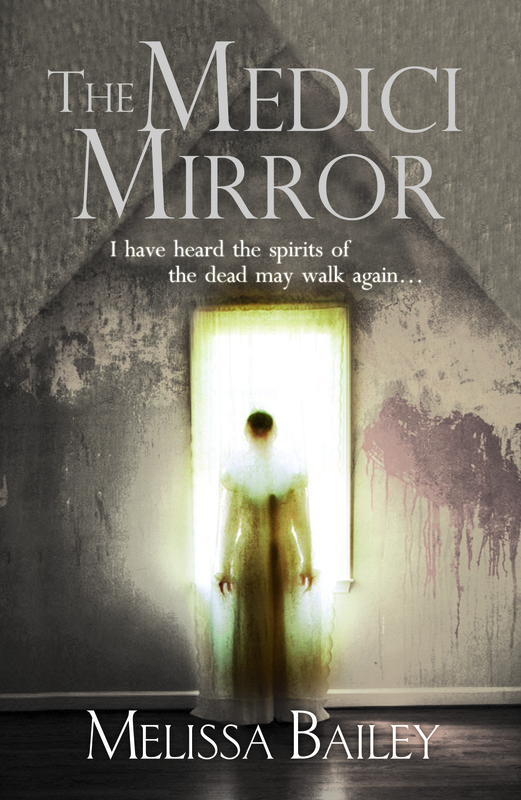 Johnny, a twenty-first century architect, unearths this mirror while renovating a Victorian shoe factory, and all hell, literally, breaks loose. 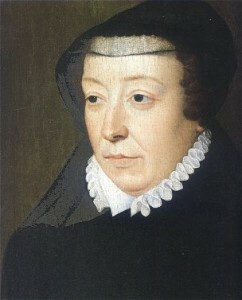 Catherine de Medici has been called the Black Queen, Madame la Serpente. She has been labelled a plotter, poisoner and practitioner of the occult. But while the stories of her villainy have been exaggerated by her successors, there is evidently some truth to them. Catherine was no doubt a skilful politician – she ruled France alongside her sons for over 30 years. Yet it is clear that if strategy failed, she did not shy away from murder. It is said that her Italian perfumer, Maitre Rene, created poisoned gloves to kill off her enemies and that on one occasion he infused an apple with deadly vapours to despatch someone on her behalf (it is said to have killed a dog by accident instead!). Also part of her entourage were the Ruggieri brothers – Cosimo and Tommaso -renowned astrologers who also practised necromancy and the black arts. As part of my research for The Medici Mirror, I travelled to the Loire valley to visit a number of Catherine’s palaces. 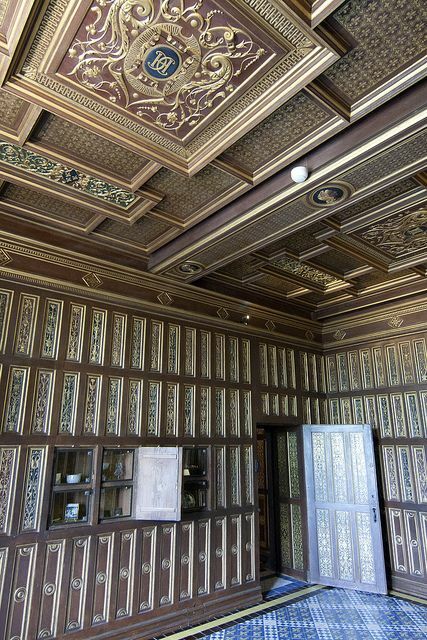 Blois was one of them and is the chateau where Catherine’s alleged apothecary of poisons was located – 237 secret compartments hidden behind wooden panelled walls. 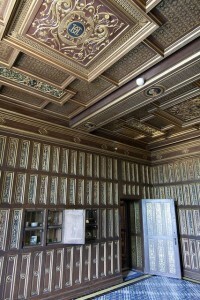 The cabinet room is right next to her private chapel and bedchamber. It’s a small intimate space and you can walk right around it and touch and open the panels where Catherine’s armoury of poisons were supposed to have been hidden. This inspired a chapter in my novel where Catherine, arsenic in hand in her hidden chamber, plots the downfall of one of her enemies. I also visited Catherine’s palace at Chaumont. 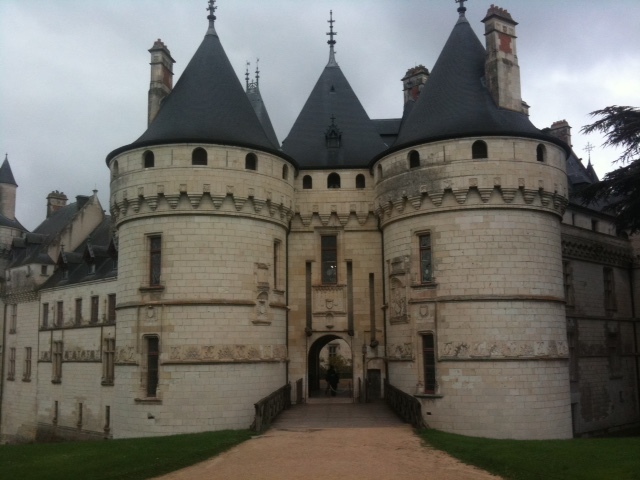 In this chateau it is said that a black magic ceremony was performed with a mirror to see how long Catherine’s sons would remain on the throne. It is also where other evidence of sorcery was found after Catherine vacated the premises – pentacles drawn on the floor, altars decorated with skulls, the remains of animal sacrifices. 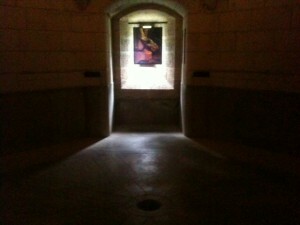 Here’s some pictures of Chaumont. I hope that you get a sense from them of just how spooky this castle was. 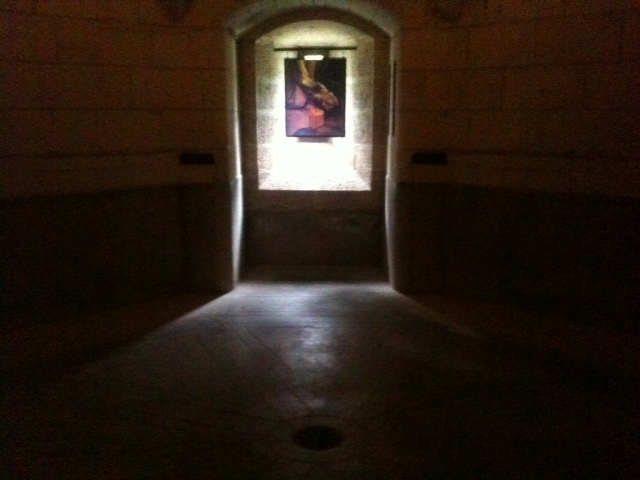 I found it incredibly creepy, more claustrophobic and more sinister than the others and could entirely imagine an occult ceremony having taken place deep in the cellars. It inspired a similar supernatural scene in The Medici Mirror, focusing on Catherine, the Ruggieri brothers and an act of dark bewitching. If you’re interested in reading this chapter, click here (http://www.melissabailey.info/chapter17.pdf) or visit my website (http://www.melissabailey.info) to see a video of me reading it in a candlelit, cobwebbed basement! Whatever you’re doing on the 31st – whether you’re reading something suitably spooky at home or out trick or treating – I wish you all a very Happy Halloween! A lot of people have asked me whether I visited the Hebrides while I was writing Beyond the Sea, set on a tiny (fictional) island off the coast of Mull, in the Western Isles of Scotland. The answer is yes. I love visiting the places I write about, to experience the mood and landscape first hand, to absorb the atmosphere. I find it easier that way to bring it to life on the page. 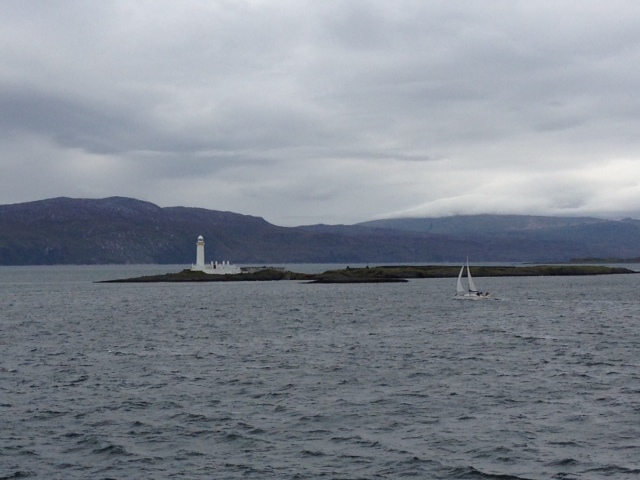 Very soon after I started writing the book, I found myself on a ferry leaving Oban (in mainland Scotland) for Craignure on Mull. The day was chilly and overcast, more like winter than autumn, and dark cloud hung low in the sky. Before long it was raining and a cold hard wind whipped me as I stood on deck, looking down at the churning sea, getting drenched but refusing to go inside. As the ferry advanced up the Sound of Mull and we passed Duart Castle in the south east corner of the island, I remembered from my research that the Swan, a Cromwellian warship, had sunk at this exact spot on 13 September 1653 – almost 360 years ago to the day. I began to think of shipwrecks and sailors and letters in bottles and another strand of the plot began to emerge. It was an exciting day for me and one that remained imprinted firmly in my mind. This journey, made in 2013, is the same one taken by Freya in Chapter 1 of the novel. 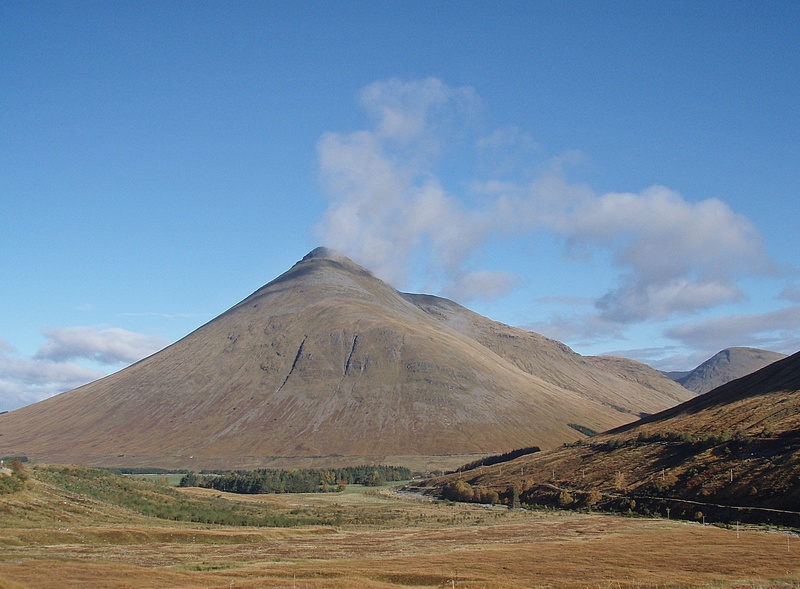 I travelled all over Mull that autumn, circling the whole island on its single track roads, past the fragile beauty of the grassy machair, the towering grandeur of Ben More. 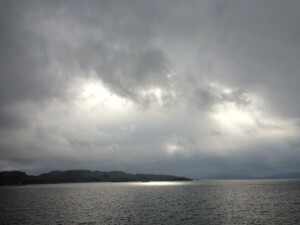 I watched sunshine break over Loch Scridain, turning its seawater brilliant blue, then saw it transformed to dull grey when the mist rolled in later that day. 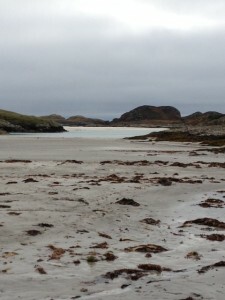 I drove to Knockvologan on the south of the island, waited until low tide, and then crossed the exposed white sand beaches of the tidal island of Erraid (the setting for Robert Louis Stevenson’s Kidnapped). I trekked past the now abandoned lighthouse keepers’ cottages and tried to imagine what it would be like to live on a tiny island like this, isolation complete when the sea rolled back in. 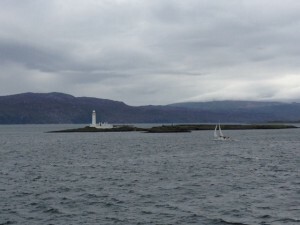 I looked out across the vastness of the ocean and caught sight of the shadowy lighthouse, Dubh Artach, floating on the horizon, somewhere between land and sea, a mirage perhaps. I travelled far and wide, looking, thinking, jotting in my notepad. I wanted to remember the sights, sounds and smells, the colours and tones of the landscape. 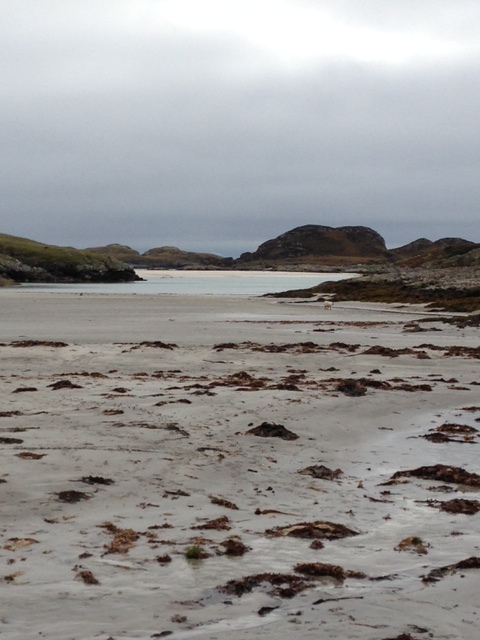 I wanted to remember my smallness in the face of all this immense Hebridean beauty. And I wanted as much as possible to echo it faithfully in the narrative of my book. It’s become clear to me over the years that a lot of people (or most of my family at least!) have little idea what being a published author actually means. When I got my book deal from Arrow back in 2012, my family were divided between those who assumed that I would now be dashing out bestsellers every few weeks and comfortably making millions (Auntie Thora) and others who assumed I’d make less than no money and that it’d take forever (Uncle Frank). 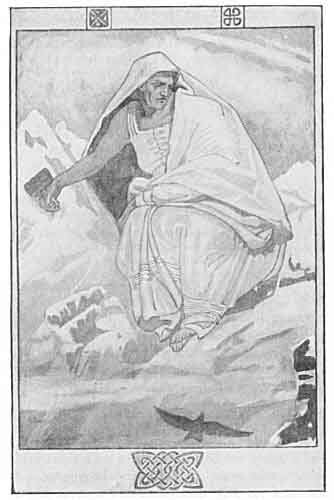 I hated to disillusion them – well, Auntie Thora anyway, who I was secretly hoping might be right. But the truth, as ever, lay somewhere in between. So, much as I love myths, I thought I’d dispel a few of the favourites. It generally takes more than a handful of days to write a novel. I know, shocker, right. Sorry Auntie Thora. A lot of fiction writers need at least a year to produce a book and it takes me a little longer. Now, of course, there are exceptions to this. 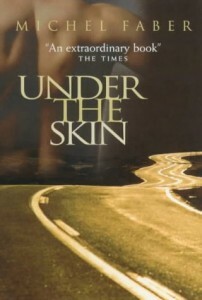 Kazuo Ishiguro famously dashed off The Remains of the Day during a four week “crash”. Oh yeah, and probably made millions from it. But that’s far from the norm. A handful of writers do extremely well (I’m thinking JK Rowling, EL James, John Grisham, James Patterson). A good number do well enough to write full time. But the largest proportion, including myself, work part time to supplement the money they make from their books. However, I don’t think it’s ever quite as bad as Uncle Frank had imagined. I remember him asking me when he came to visit once if we’d had to re-mortgage the house to give money to the publishers (about £50,000 he seemed to think). Slightly taken aback, I explained that that wasn’t quite how it worked – that the publishers in fact paid me an advance so that I could spend time writing. They then recovered that from the profits of the book, and were entitled to far greater profits than me because they were the ones taking the risk. Uncle Frank looked genuinely shocked. I’d obviously dislodged some long held view of the way things worked. When I showed him the study where I write, he went on to voice what I think is a more commonly held view. ‘Ah, so this is where you sit and wait for inspiration!’ I nodded and laughed, not wanting to disabuse him again. But it doesn’t really work like that either. Contrary to what most of my family think, I am not generally found wandering around my house in a kaftan, sipping on mint juleps and waiting for the muse to strike. More’s the pity. I’d love to be doing that on a daily basis. But instead, I am found in that same study, tapping away, trying hard to improve my writing. In short, being a writer is much like any other career. The longer you do it, the better you become at it. You have to slog away – the breakthroughs come because you’re working hard, not because you’re waiting for moments of genius to descend. There are deadlines and pressures – just like any other job. It’s a tough and uncertain career. Time is spent agonising over whether people will like your book or whether in fact anyone will buy it at all! And it can be lonely, stuck in your own head for so much of the time. But that’s where the joys of social media come in. Through it I’ve met so many lovely authors and fabulous book bloggers who provide a huge amount of positivity and support. All things considered, the good, the bad and the ugly, I love being a writer. And I wouldn’t change it for the world. One of the most nerve wracking experiences of my life was waiting to find out whether or not my first novel would be published. Forget ‘A’ levels and Finals, or even buying a house – this was a whole new and acute level of angst. By the time my first novel, The Medici Mirror, was sent out to publishers, I had already been working on it for four years. The first two were spent writing a draft, then rewriting it, until I considered it was good enough to attract an agent. When I had finally gathered sufficient courage to send the book out, I was lucky enough to get an offer of representation from Luigi Bonomi of LBA. The next two years were spent working with him on the novel. I rewrote large sections of it. And by large, I mean large. He’d tactfully described the last half of it as ‘plot light’ – perhaps a nice way of saying that the story had lost its way! So I wrote and rewrote again, polished and refined, until Luigi felt the manuscript was ready. The day finally arrived, the much longed for yet still terrifying day, when Luigi pushed the button on his computer and jettisoned The Medici Mirror into the inboxes of fourteen of London’s finest publishers. ‘Keep your fingers crossed,’ he told me then. ‘It’s going to be a nerve wracking time.’ Little did I know. During the days that followed I somehow managed to get myself to work. I sat in the quiet darkness of a TV recording studio, paying scant attention, and worried, silently. All those warnings that I had heard over the last four years crowded into my mind. ‘You’re crazy to write a novel’. 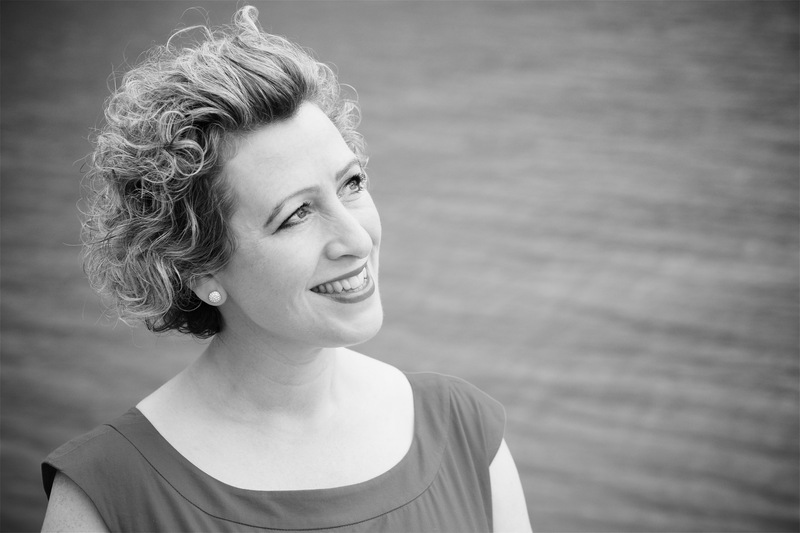 ‘It’s so hard to get published’. ‘It’s a large chunk of your life to invest in such a speculative venture’. I tried to still the voices of the naysayers as I sat in that oppressive darkness and instead attempted to focus on all of the positives. My agent saw something in my writing. That was encouraging. And people got published all the time. So why couldn’t it be me? Two days in and Luigi forwarded the loveliest email from an editor at Preface, a part of Random House. Her name was Rosie de Courcy. She had loved the novel and wanted to publish it. My heart leapt. I almost fainted. Was it a done deal then? Unfortunately, my agent explained, it wasn’t as simple as that. Rosie now had to persuade the whole team at Random House to get on board. My elation slipped into despair. That would be a tall order, a small voice inside me said. Better not get your hopes up too much. For the next fourteen long days, the rejections dribbled in. There were a few very near misses but no-one had said yes. I began to lose faith. But I knew that Rosie was still out there rallying her troops and that gave me heart. Two weeks after her first email, Rosie sent an offer through. When I read it, I whooped loudly in the darkness of that recording studio. We had to halt and do a swift re-record – I got a black look from the producer. But I didn’t care. My sense of relief and elation was so intense. And Rosie de Courcy at Preface had offered to publish not one, but two, of my books – The Medici Mirror and my second novel, Beyond the Sea. The Wind-Up Bird Chronicle by Haruki Murakami. This strange and surreal tale follows the life of everyman Toru Okada, after first his cat, and then his wife, disappear. Okada’s mundane world, in which he cooks spaghetti, drinks beer and listens to jazz, is suddenly transformed by a succession of exotic and menacing characters who propel him on a dangerous odyssey of self-discovery. Set in contemporary Japan, still haunted by the brutality of its past, it is a tale of love and war, dreams and reality, of what has been lost and can never be recovered. 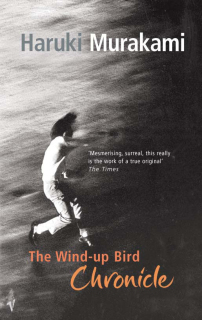 It is a powerful, philosophical story, told in Murakami’s perfectly pared down prose. And I promise, if you read it, you will never look at a well in quite the same way. Under the Skin is Michel Faber’s first novel and has one of the most exciting opening chapters I’ve ever read. 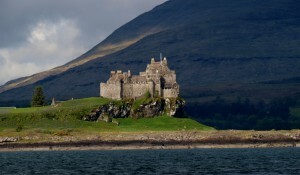 Isserley, driving through the Highlands of Scotland, in her decrepit little car, is eyeing up hitch-hikers. But not just any old hitch-hiker will do. She wants a buff one, a hunk on legs, as she says. What does she want them for? As the novel takes off, and that question is answered, the reader is taken on a journey they could never have predicted. A twisty turny sci-fi fantasy adventure, it’s a wild rip roaring ride. 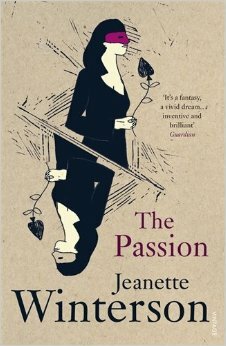 The Passion is my favourite of Jeanette Winterson’s novels. An eclectic blend of history, fantasy and dark fairy tale, it follows the intertwining paths of Henri, a young French soldier cook, tasked with satisfying Napoleon’s immense appetite for chickens and Villanelle, the web footed daughter of a Venetian boatman, who miraculously can walk on water but who has lost her heart to the mysterious Queen of spades. ‘Trust me. I’m telling you stories,’ is the self-referential refrain the characters repeat. 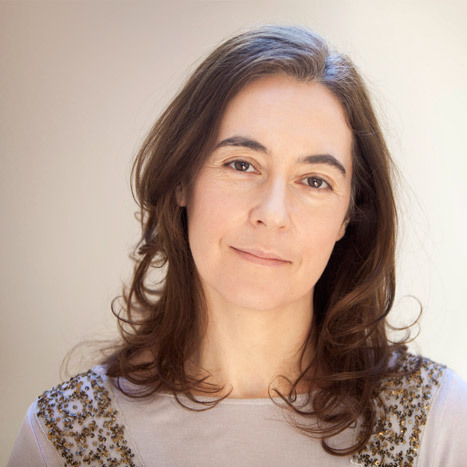 And trust me when I tell you that this story of love, betrayal and passion, exquisitely told in Winterson’s spare yet poetical prose will not disappoint. 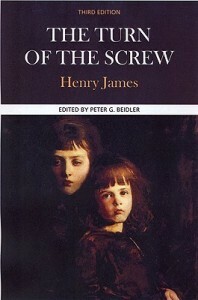 The Turn of the Screw by Henry James is one of the best ghost stories ever. At its heart is the governess, despatched to an isolated house in Essex, to care for two young orphans. She soon begins to suspect that the children are being haunted by the ghosts of her predecessor, Miss Jessel and her lover Peter Quint. Written from the perspective of the governess, the novel’s brilliance lies in the way it sheds doubt on the reality of the ghosts, questioning instead her sanity. James ratchets up the tension and the book’s thrilling denouement still haunts me to this day. 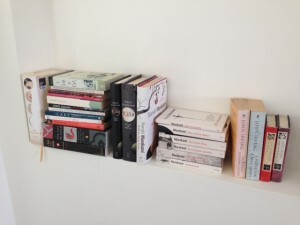 I write in the loft at the top of the house – a warm, bright, white space, with only a few things on the walls and very little furniture (a desk, a chair and some bookshelves). Every day, after I’ve had breakfast, I head up there, switch my computer on and go straight into Word before I can get too distracted by other things – Facebook, twitter, other people’s books, the view through the big window, what the neighbours are doing etc. I remember reading an article by David Mitchell in which he said he practically runs to his laptop every day and opens the file of his novel without asking himself whether he’s in the mood to work on it. Only when the words are on the screen is he safe. Up until that moment the possibility for diversions are endless. I know what he means and I try to follow his example. 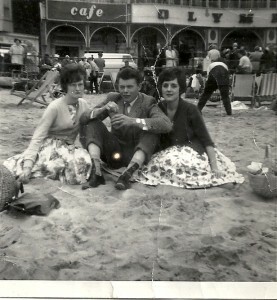 But of everything on that board a black and white photo of my parents on the beach at Scarborough in 1960 is my favourite. I love it, faded and crinkled as it is, and the visible lines running across it only make me feel a greater sense of nostalgia. My dad is in the middle, my mum on the right. 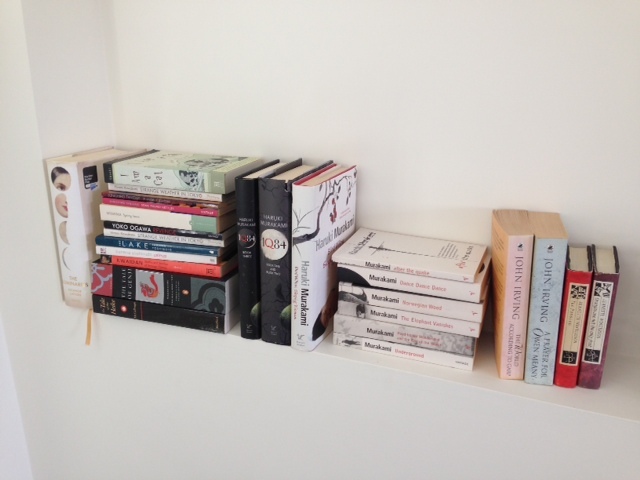 Behind my desk are bookshelves containing the novels and short stories of some of my favourite writers: Haruki Murakami, Michel Faber, Jeanette Winterson, Banana Yoshimoto, to name but a few. 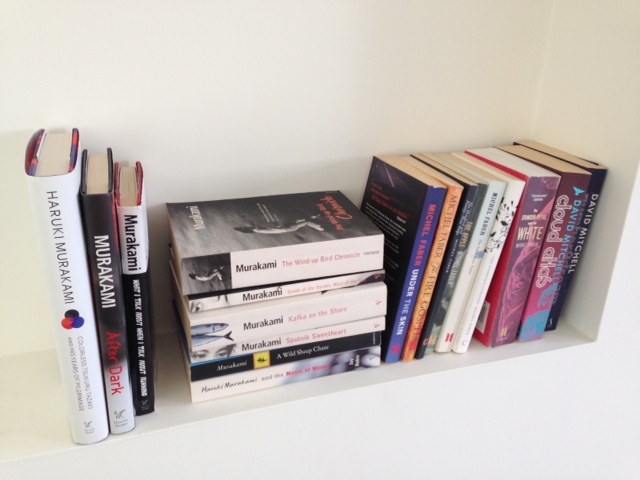 There are also a couple of overloaded shelves packed full of ‘to be read’ books. I try not to turn around and pick any of them up while I’m writing and generally I’m pretty good about it. But occasionally, if the words aren’t flowing too well, I might swivel round in my chair and accidentally find myself reading someone else’s words all day. No bad thing. As long as it doesn’t happen too often!